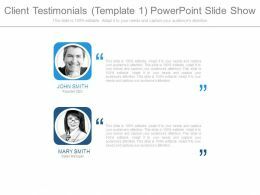 Presenting client testimonials template1 powerpoint templates. 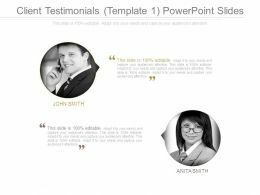 This is a client testimonials template1 powerpoint templates. This is a two stage process. The stages in this process are business, management, marketing, merry smith, anita smith. 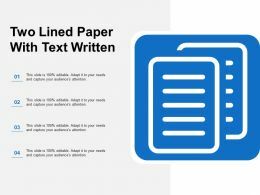 Presenting client testimonials template 3 powerpoint slide rules. This is a client testimonials template 3 powerpoint slide rules. This is a one stage process. The stages in this process are anita smith, communication. 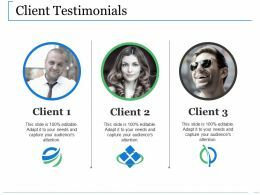 Presenting client testimonials template1 ppt sample download. 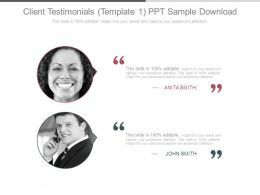 This is a client testimonials template1 ppt sample download. This is a two stage process. The stages in this process are anita smith, john smith, business, management, presentation. Presenting quotes for business testimonials presentation deck. 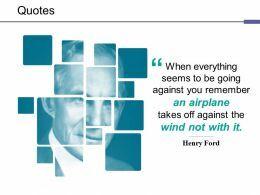 This is a quotes for business testimonials presentation deck. This is a two stage process. The stages in this process are finance manager, product manager. 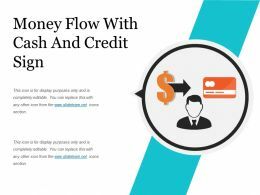 Presenting client customer testimonials presentation powerpoint example. This is a client customer testimonials presentation powerpoint example. This is a two stage process. The stages in this process are we are emily parker, charlie albert. 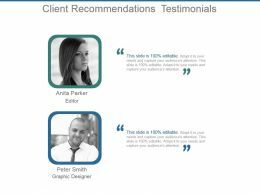 Presenting client testimonials template 1 powerpoint slides. 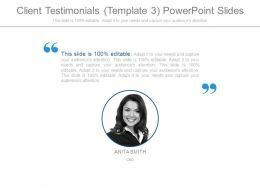 This is a client testimonials template 1 powerpoint slides. This is two stage process. The stages in this process are john smith, anita smith, communication, management, business, success. 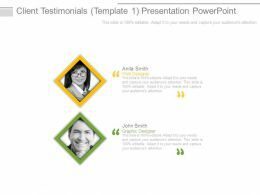 Presenting client testimonials template3 powerpoint slide template. 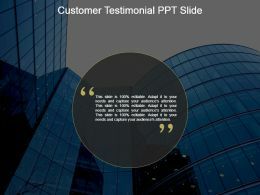 This is a client testimonials template3 powerpoint slide template. This is a one stage process. The stages in this process are business, management, marketing, ruben parker, strategy, presentation. Presenting client recommendations testimonials powerpoint slide download. This is a client recommendations testimonials powerpoint slide download. This is a two stage process. The stages in this process are anita parker, peter smith, editor, graphic designer. Presenting client customer testimonials ppt examples slides. 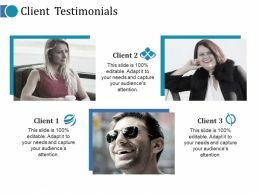 This is a client customer testimonials ppt examples slides. This is a two stage process. 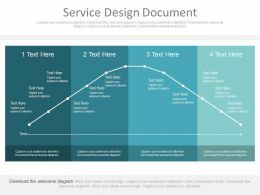 The stages in this process are peter clark graphic designer, marry smith seo. Presenting customer testimonial powerpoint slide templates. 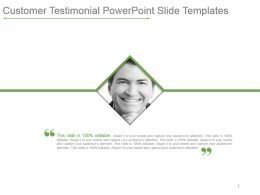 Presenting customer testimonial powerpoint slide templates. 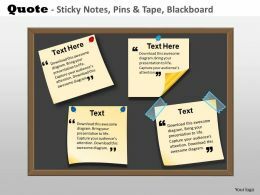 This is a customer testimonial powerpoint slide templates. This is a one stage process. The stages in this process are business, communication, strategy, success, management. Presenting customer testimonial channel consumer education ppt presentation. 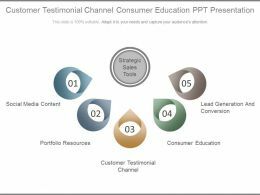 This is a customer testimonial channel consumer education ppt presentation. This is a five stage process. The stages in this process are strategy, management. Presenting client testimonials template 1 powerpoint slide backgrounds. This is a client testimonials template 1 powerpoint slide backgrounds. This is two stage process. The stages in this process are client, communication, business, strategy, success. Presenting client testimonials and feedback ppt sample. This is a client testimonials and feedback ppt sample. This is a two stage process. The stages in this process are client, icon, business, strategy, opinion. Presenting customer testimonial. This is a customer testimonial. This is a one stage process. The stages in this process are quotes, business, marketing. Presenting client testimonials powerpoint slide background. This is a client testimonials powerpoint slide background. This is a two stage process. The stages in this process are finance manager, product manager. Presenting customer testimonials for business ppt model. This is a customer testimonials for business ppt model. This is a two stage process. The stages in this process are carol smith ceo, john wolly manager. Presenting testimonials by clients powerpoint slide inspiration. This is a testimonials by clients powerpoint slide inspiration. This is a two stage process. The stages in this process are people, communication, business, marketing, message. Presenting client customer testimonials presentation portfolio. 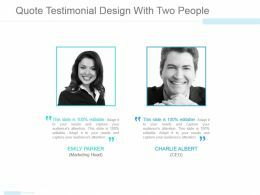 This is a client customer testimonials presentation portfolio. This is a two stage process. The stages in this process are we are lily william editor, john finder graphic designer. Presenting customer testimonial ppt slide. Presenting customer testimonial ppt slide. This is a customer testimonial ppt slide. This is a one stage process. The stages in this process are business, marketing, customer, conversation, icon. 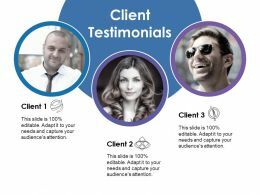 Presenting client testimonials template2 powerpoint slides. 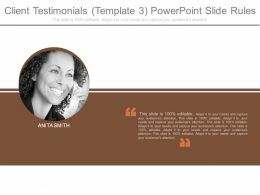 This is a client testimonials template2 powerpoint slides. This is a three stage process. The stages in this process are business, management, marketing, process, strategy. 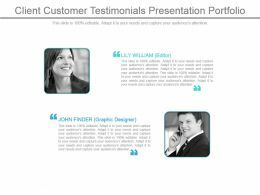 Presenting client testimonials template 3 powerpoint presentation. 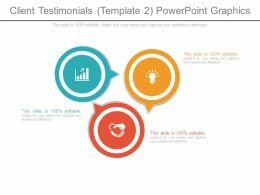 This is a client testimonials template 3 powerpoint presentation. This is one stage process. The stages in this process are anita smith, client, presentation, strategy, business, success. Presenting recommendation testimonials for self introduction presentation visuals. 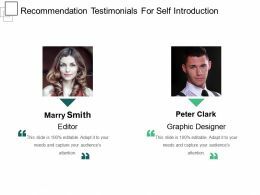 This is a recommendation testimonials for self introduction presentation visuals. This is a two stage process. The stages in this process are career progression, self introduction, work experience. 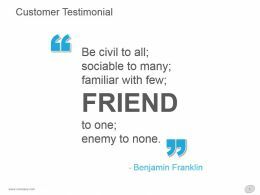 We are proud to present our customer testimonials quotes powerpoint slides and diagrams 8. 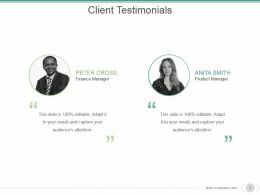 Our Customer Testimonials Quotes Powerpoint Slides and Diagrams 8 are effectively colour coded to priorities your plans. They automatically highlight the sequence of events you desire. 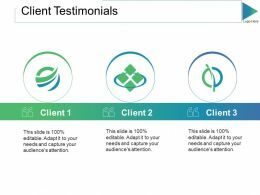 Presenting client testimonials template3 ppt sample presentations. 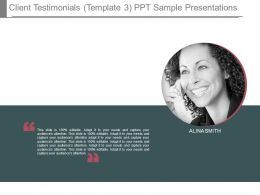 This is a client testimonials template3 ppt sample presentations. This is a one stage process. The stages in this process are alina smith, business, management, marketing, presentation. Presenting client testimonials powerpoint presentation examples. This is a client testimonials powerpoint presentation examples. This is a two stage process. The stages in this process are peter cross, finance manager, anita smith, product manager. Presenting client customer testimonials ppt icon. This is a client customer testimonials ppt icon. This is a two stage process. The stages in this process are marry smith ceo, peter clark graphic designer. 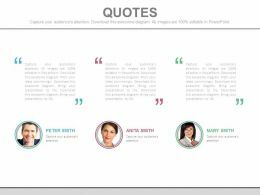 Presenting client testimonials template3 presentation portfolio. 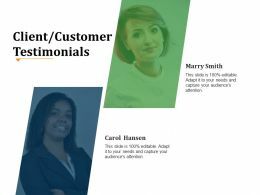 This is a client testimonials template3 presentation portfolio. This is a one stage process. The stages in this process are business, management, anita smith ceo, strategy, marketing. 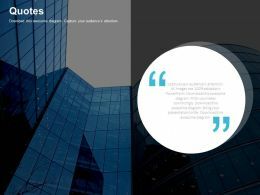 Presenting client testimonials template1 presentation powerpoint. 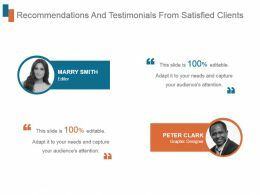 This is a client testimonials template1 presentation powerpoint. This is a two stage process. The stages in this process are anita smith web designer, john smith graphic designer. 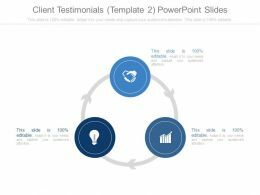 Presenting client testimonials template3 powerpoint slides. 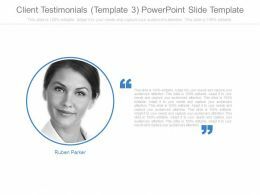 This is a client testimonials template3 powerpoint slides. This is a one stage process. The stages in this process are business, marketing, quotes, communication, sales manager. Presenting customer testimonials ppt samples. This is a customer testimonials ppt samples. This is a two stage process. The stages in this process are john smith, carol smith. 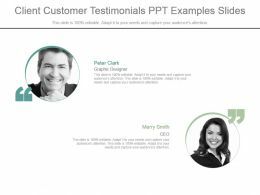 Presenting client testimonials template 1 sample of ppt. 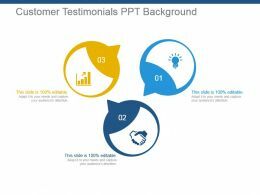 This is a client testimonials template 1 sample of ppt. This is two stage process. The stages in this process are mary smith, john smith. Presenting customer testimonial sample of ppt presentation. 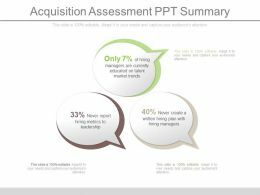 This is a customer testimonial sample of ppt presentation. This is a two stage process. The stages in this process are john smith manager, carol smith financer. Presenting customer testimonials ppt background. This is a customer testimonials ppt background. This is a three stage process. 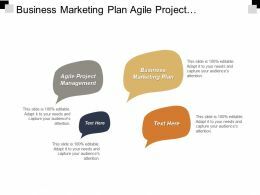 The stages in this process are customer, testimonials, business, marketing, strategy. 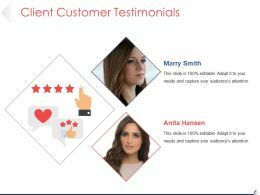 Presenting client testimonials template 1 powerpoint slide template. 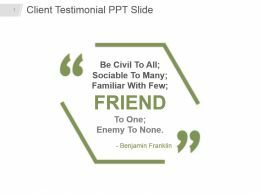 This is a client testimonials template 1 powerpoint slide template. This is a two stage process. The stages in this process are mary smith, john smith. We are proud to present our customer testimonials quotes powerpoint slides and diagrams 3. 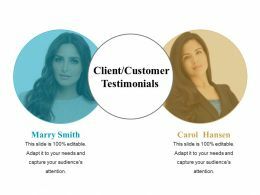 Our Customer Testimonials Quotes Powerpoint Slides and Diagrams 3 are aesthetically designed to attract attention. We guarantee that they will grab all the eyeballs you need. Presenting quotes for client testimonials for website powerpoint slides. 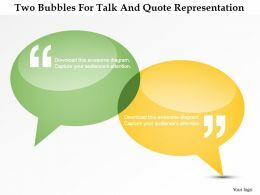 This Power Point template slide has been crafted with graphic of quotes. This PPT slide contains the concept of client testimonial representation for website. Use this PPT slide for business and marketing related presentations. Presenting client testimonial ppt slide. This is a client testimonial ppt slide. This is a one stage process. The stages in this process are idea, description, dialogue, quotes, opinion. Presenting recommendations and testimonials from satisfied clients ppt slides. 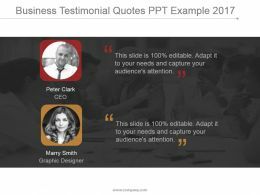 This is a recommendations and testimonials from satisfied clients ppt slides. This is a two stage process. The stages in this process are marry smith, editor, peter clark, graphic designer. 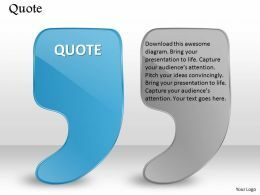 Presenting customer feedback and client testimonial quotation slide ppt icon. This is a customer feedback and client testimonial quotation slide ppt icon. This is a two stage process. The stages in this process are business, marketing, strategy, success, people. 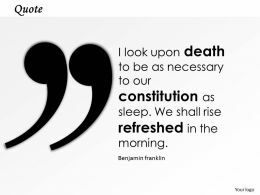 Presenting business testimonial quotes ppt example 2017. 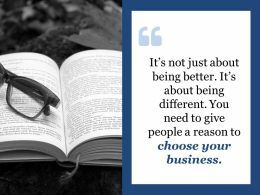 This is a business testimonial quotes ppt example 2017. This is a two stage process. The stages in this process are peter clark ceo, marry smith graphic designer. 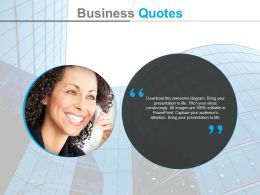 Presenting quote design for business feedback testimonial ppt ideas. 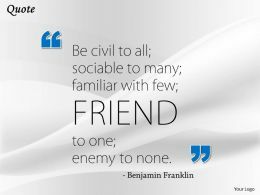 This is a quote design for business feedback testimonial ppt ideas. This is a two stage process. The stages in this process are lily william, john finder. Presenting client testimonial for service excellence powerpoint slide information. This is a client testimonial for service excellence powerpoint slide information. This is a two stage process. The stages in this process are harry bails ceo, angela smith manager. 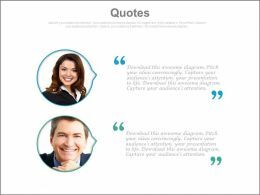 Presenting quote testimonial design with two people ppt images. 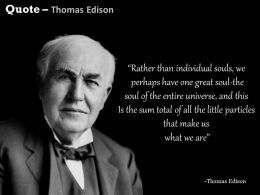 This is a quote testimonial design with two people ppt images. This is a two stage process. The stages in this process are emily parker, charlie albert. Presenting customer testimonial design with two persons powerpoint slide show. This is a customer testimonial design with two persons powerpoint slide show. This is a two stage process. The stages in this process are kelly olson, harry bails. Presenting two team mates for testimony powerpoint slides. This Power Point template slide has been crafted with graphic of two team mates. This PPT slide contains the concept of team testimony analysis. Use this PPT slide for business and marketing related presentations. Presenting client testimonials template1 powerpoint slide show. 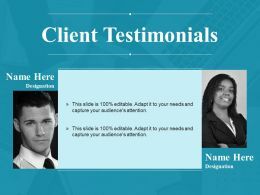 This is a client testimonials template1 powerpoint slide show. This is a two stage process. The stages in this process are business, marketing, quotes, communication, sales manager. Presenting this set of slides with name - Quotes Ppt Influencers. This is a one stage process. The stages in this process are Quotes, Communication, Marketing, Business, Strategy. Presenting this set of slides with name - A Proven Record Of Success Ppt Summary Inspiration. This is a three stage process. The stages in this process are Quotes, Business, Communication, Management, Concepts. Presenting business promotional techniques for web marketing ppt examples slides. This is a business promotional techniques for web marketing ppt examples slides. This is a ten stage process. The stages in this process are article, web content, social, blogging, seo, news, copywriting, blogging. 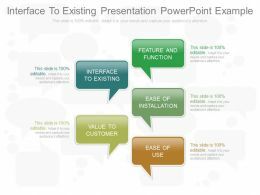 Presenting interface to existing presentation powerpoint example. 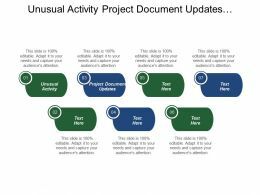 This is a interface to existing presentation powerpoint example. This is a five stage process. The stages in this process are feature and function, interface to existing, ease of installation, value to customer, ease of use. 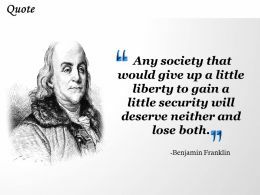 Presenting this set of slides with name - Quotes Ppt Pictures. This is a one stage process. The stages in this process are Quotes, Communication, Business, Marketing, Opinion. Presenting this set of slides with name - Two Lined Paper With Text Written. This is a four stage process. The stages in this process are Lined Paper, Ruled Paper, Printed Paper. Presenting this set of slides with name - Client Testimonials Ppt Show Structure. This is a three stage process. The stages in this process are Business, Management, Planning, Team, Communication. Presenting product testimonials with expert review ppt slides. 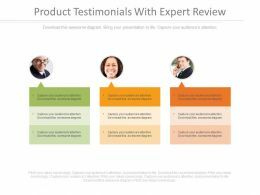 This is a product testimonials with expert review ppt slides. This is a three stage process. The stages in this process are management, business, strategy, marketing. Presenting customer testimonial description ppt sample file. This is a customer testimonial description ppt sample file. This is a one stage process. The stages in this process are business, marketing, management, strategy, success. 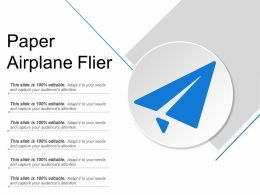 Presenting this set of slides with name - Paper Airplane Flier. This is a one stage process. 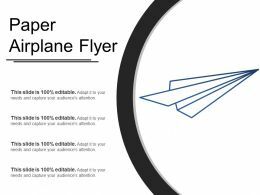 The stages in this process are Paper Airplane, Paper Plane, Paper Flight. Presenting this set of slides with name - File Appendix Icon Paper Clip. This is a one stage process. The stages in this process are Supplement Icon, Addendum Icon, Appendix Icon. 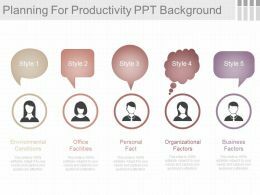 Presenting ppt planning for productivity ppt background. This is a planning for productivity ppt background. This is a five stage process. The stages in this process are environmental conditions, office facilities, personal fact, organizational factors, business factors. 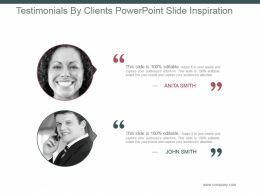 Presenting this set of slides with name - Client Customer Testimonials Powerpoint Ideas. This is a two stage process. The stages in this process are Marry Smith, Carol Hansen. Presenting this set of slides with name - Client Testimonials Ppt Show Clipart Images. This is a three stage process. The stages in this process are Client, Communication, Business, Marketing, Management. Presenting this set of slides with name - Client Testimonials Presentation Portfolio. This is a two stage process. The stages in this process are Marry Smith, Anita Hansen. Presenting this set of slides with name - Client Customer Testimonials Presentation Powerpoint. This is a two stage process. The stages in this process are Marry Smith, Carol Hansen. Presenting this set of slides with name - Client Testimonials Ppt Model Introduction. This is a two stage process. The stages in this process are Teamwork, Communication, People, Business, Designation. 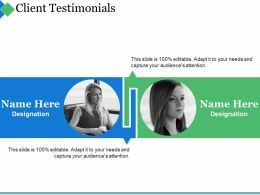 Presenting client testimonials template2 ppt presentation. 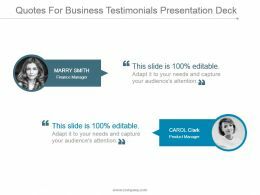 This is a client testimonials template2 ppt presentation. This is a three stage process. The stages in this process are arrows, business, management, marketing, process, strategy. 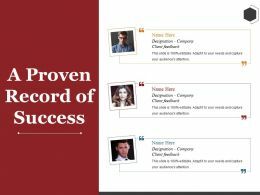 Presenting this set of slides with name - Client Testimonials Ppt Infographic Template. This is a three stage process. The stages in this process are Client Testimonials, Communication, Management, Planning, Business. Presenting this set of slides with name - Client Testimonials Powerpoint Slide Themes. This is a two stage process. The stages in this process are Business, Client Testimonials, Designation, Planning, Management. Presenting this set of slides with name - Client Testimonials Ppt Professional Ideas. This is a three stage process. The stages in this process are Teamwork, Communication, People, Business, Marketing. 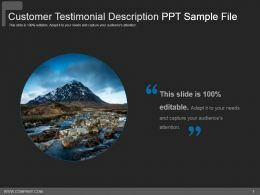 Presenting client testimonials template 3 powerpoint slide template. 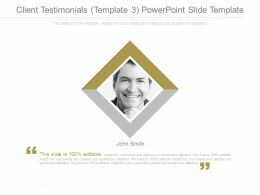 This is a client testimonials template 3 powerpoint slide template. This is one stage process. The stages in this process are john smith, client, business, management, success. 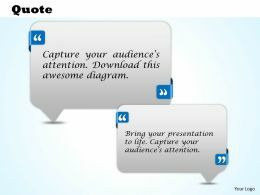 Presenting client testimonials template2 powerpoint slide presentation tips. 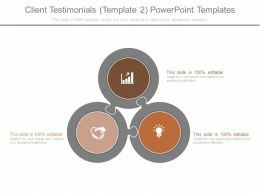 This is a client testimonials template2 powerpoint slide presentation tips. This is a three stage process. The stages in this process are business, marketing, process, management, strategy. Presenting client testimonials template2 example of ppt presentation. 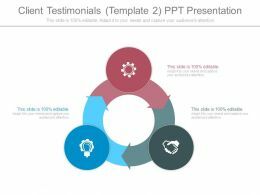 This is a client testimonials template2 example of ppt presentation. This is a three stage process. The stages in this process are business, management, process, strategy, marketing. 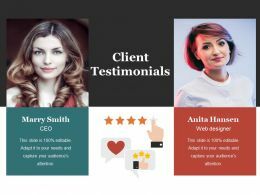 Presenting client testimonials template 2 powerpoint graphics. 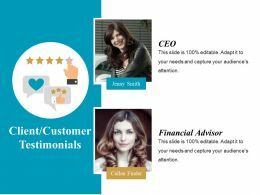 This is a client testimonials template 2 powerpoint graphics. This is three stage process. The stages in this process are business, process, icons, marketing, strategy, success. 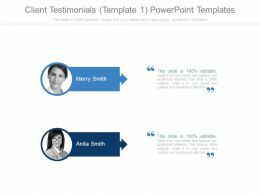 Presenting client testimonials template 2 powerpoint templates. 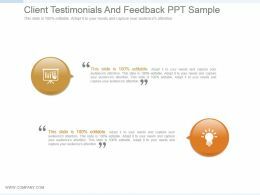 This is a client testimonials template 2 powerpoint templates. This is three stage process. The stages in this process are business, icons, process, marketing, strategy, success. 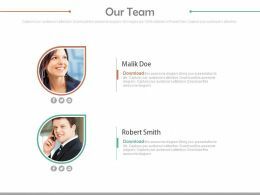 Presenting client testimonials template 2 powerpoint slide introduction. 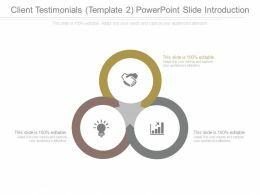 This is a client testimonials template 2 powerpoint slide introduction. This is three stage process. The stages in this process are business, icons, marketing, strategy, process, success. 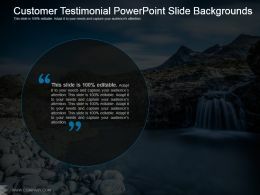 Presenting this set of slides with name - Client Customer Testimonials Powerpoint Slide Background Image. This is a two stage process. The stages in this process are Financial Advisor, Jenny Smith, Team, Business, Management. 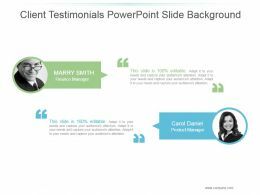 Presenting this set of slides with name - Client Customer Testimonials Powerpoint Slide Background Picture. This is a two stage process. The stages in this process are Marry Smith, Carol Hansen, Team, Business, Management. 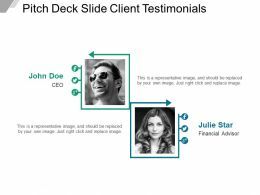 Presenting this set of slides with name - Client Testimonials Ppt Slides Graphic Tips. This is a three stage process. The stages in this process are Business, Marketing, Strategy, Icons, Planning. Presenting this set of slides with name - Client Testimonials Ppt Summary Designs Download. This is a two stage process. The stages in this process are Business, Management, Planning, Team, Communication. We are proud to present our customer testimonials quotes powerpoint slides and diagrams 1. 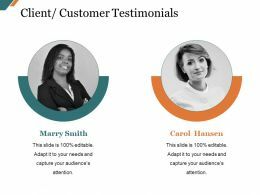 Our Customer Testimonials Quotes Powerpoint Slides and Diagrams 1 provide you with a vast range of viable options. Select the appropriate ones and just fill in your text.